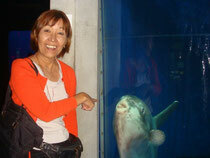 Friendly fishes in aquarium ' Umitamago' welcomed me and mother. We felt like fish. They healed our strain for real.